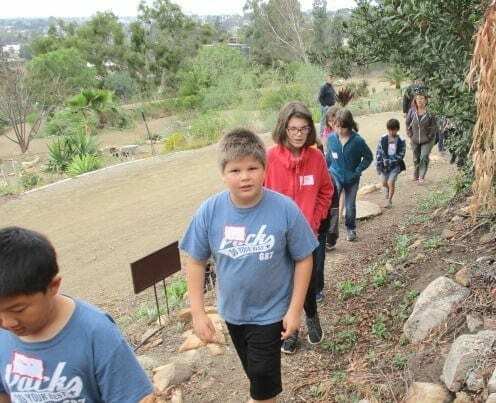 It was a cool, overcast winter day in Vista, but a lively group of kids and their parents enjoyed a sunny Gardens experience with Farmer Jones on February 10 at Alta Vista Botanical Gardens. 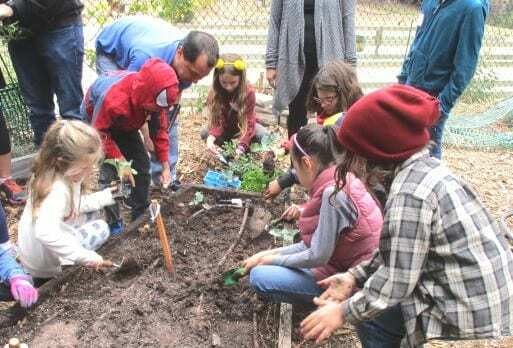 The group of 40 included Cub Scouts, Garden members, kids and families, and middle-school volunteers who enjoyed learning about plants and got their hands dirty. All had a fun time. The topic was “Spring Planting” and plant they did! First, Farmer Jones reviewed plant parts – roots that keep the plant in place, stems to stand tall, leaves to make food, flowers pollinated by insects, and fruits with seeds to start the plant cycle all over again. Since the best winter veggies are leafy, she shared and compared cabbage, Swiss chard, and lettuce seeds along with carrots. The attentive group knew that dark leafy greens provide great nutrition, as well as carrots for Vitamin A for healthy eyesight. from previous festivals and field trips into a dark, nutrient-rich planting mix. Commercial potting soil made from peat moss, bark, and Perlite was also available for their take-home planting. Farmer Jones then shared plant starts from a local nursery – broccoli, tomatoes, parsley, and pepper that the kids would be planting in the Incredible Edibles Garden. She introduced onion “sets” which are the little bulbs that grow into the big onion bulbs we use for cooking. She shared three kinds of “seed” potatoes that were already sprouting – Yukon Gold, Sangre Red, and Russian Banana. Yes, potatoes can be called bananas – go figure! Farmer Jones let the families know that potatoes that sprout in the pantry at home can also be planted and can produce edible potatoes or beautiful leafy plants – sweet potatoes are great for this. And then the fun part, the hands-on planting began – with reassurances that “We are washable” and “Playing in dirt is good for your immune system.” Each kid picked two 4-inch pots, filled them with soil, and then chose from the seeds doled out by the middle-school volunteers. Yes, you do need to cover the seeds. Yes, you do get to take them home. Yes, put your name on the pot. And yes, you might want to transplant to a deeper pot after the plants sprout – carrots do need to grow longer, underground. And then the group moved to the garden bed which the middle-school volunteers had cleared and wet down. Each kid dug a hole, “tickled the roots,” and added a started plant to make a bright colorful start on the edibles. More holes in the raised bed soon filled with onion bulbs and potatoes. It was amazing how busy hands were happy hands, with smiles all around. Yes, hands got washed but nary an anti-bacterial gel was in sight. They loved the hands-on experience and learned about plants, too. The Kids in the Garden class is offered monthly; the next class will be March 10 on Bugs and Butterflies. The class will include Brownie Girl Scouts working on their Bugs badge – finding insects and creating bugs – and is open to all. Class fee is $5 per child and $5 per adult Garden entry. Pre-registration is required – contact farmerjonesavbg@gmail.com or (760) 822-6824. 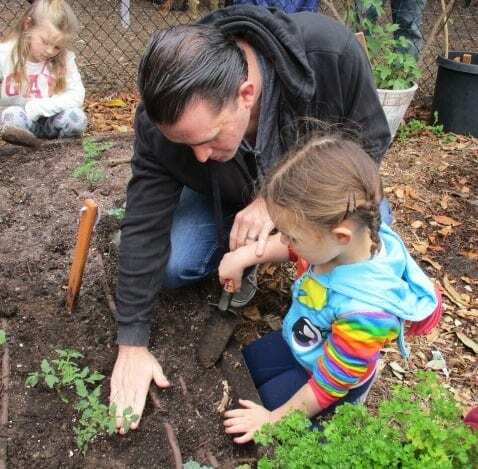 The Kids in the Garden class is free with AVBG Family membership which is $60 a year; membership applications are on the website, altavistabotanicalgardens.org. The class schedule for 2018 is posted on the website. Field trips for scouts, school and home school classes are available by contacting Farmer Jones. Contact Nancy B Jones for more information (760) 822-6824.